Via The Hill comes word of a survey (.pdf) on young Americans' attitudes toward politics and public service by the Harvard Institute of Politics. The poll asked "When it comes to voting, wth which party to you consider yourself to be affiliated?" 38% identified themselves as Democrats, 37% as Independents and 22% as Republicans. 10% stated that they are Independent and lean Democrat. 5% said they are Independent and lean Republican. 22% said they do not lean either way. A liberal Asheville city council member announced this week he’d run as an Independent in 2012 against U.S. Rep. Heath Shuler, D-Waynesville, potentially eroding Shuler’s Democratic base and making for a tough re-election bid for the three-term congressman. A former editor for the Asheville-based newspaper Mountain Xpress, Cecil Bothwell acknowledged he has an uphill battle . . . .
to even get on the ballot as an Independent, Bothwell must by Jan. 1, 2012, garner enough voter signatures to equal 4 percent of the total number of registered voters in the 15-county congressional district — about 20,000 signatures. Then, to win, he must battle an experienced candidate with the ability to raise plenty of money to fund his re-election efforts against Shuler, who’s war chest will easily top $1 million by the time campaign season starts. I take exception to the headline that characterizes me as a "far-left liberal." I want to reign in the Wall street crooks who have beggared those of us in the American working class. I believe we should impose the 40 percent tariff on imports that we had for 200 years before NAFTA and bring jobs back to America. I say we should end the failed war on drugs and invest in education and treatment instead of prisons. I believe it's time to stop spending money on wars of choice and spend money rebuilding America. Howie Hawkins, the recent Green Party candidate for Governor, applauded effort by a wide range of community and labor groups to occupy the State Capitol to protest the austerity budget agreed to by Governor Cuomo and state legislative leaders. Hawkins was in Albany to join in the protests. "Wisconsin showed us that working people don't have to roll over and just take the attacks on their living standards from the two major parties. In Wisconsin, the Republican Governor led the attacks. In NY, it has been a Democrat Governor, who began attacking public workers and their modest pensions months before he was elected. It's time for New Yorkers to reject the misinformation peddled by the two major parties. Three decades on unrelenting bipartisan assault on the living standards of average New Yorkers have resulted in the worst Depression in 70 plus years, the greatest income inequality since 1927 and a massive budget deficit from huge tax cuts to the rich. The people of NY needs to rise up and say that this austerity budget will not stand," said Hawkins. Hawkins said that while he supported continuing the so-called millionaires tax rather than giving the wealthy a $5 billion tax cut by ending it, far more fundamental reform of the state tax system was needed to make the wealthy provide their fair share, invest in needed programs, and provide fiscal relief to school districts and local governments. . . . The first special primary election for a Congressional office under California’s top two open primary system has been scheduled for May 17th . . . if no candidates withdraw from the race or are struck from the ballot, voters in the district will have a wide array of candidates to chose from in the primary: five Democrats, six Republicans, five candidates designated as having “no party preference,” one Libertarian, and one Peace and Freedom Party candidate. Observers predict that, due to the high number of candidates in the race, no one will win an outright majority. The top two vote-getters in the May primary will proceed to the special general election scheduled for July 12th. Let’s assume, for the moment, that all five Democratic candidates in the current race were competitive among Democratic voters, and that all six Republicans were equally favorable to GOP voters. It is possible that no Democrat would receive more than 9% of the vote and that no Republican would garner even 5%. If an Independent or third party candidate in such a race had the backing of just one in ten voters, he or she would be assured a place on the general election ballot. The diluting effect of multiple candidates from both major parties thus provides a potential strategic opening to Independent and third party candidates . . . Right now, the idea exists only in theory. It’s been mentioned in articles and speeches, but there is no formal apparatus. Yet, among Latinos, there is a palpable amount of disillusionment with both political parties and especially with Democrats. . . .
Or listen to Arnoldo Torres, a Sacramento CA-based Democratic strategist. “Latinos are starting to realize that Democrats are not responsive to their concerns,” Torres said. “In fact, there is phenomenal ignorance in both parties. Latinos have got to change the paradigm by demanding more.” . . . Among Latino voters in California, Independents already outnumber Republicans. It's a decent overview that hopefully clarifies some of the terminology I've developed: Major Party, Minor Party and LTP or "more local" and "less local" election or two-stage election as where the first stage is a winner-doesn't-take-all election and the second stage is a winner-take-all election. It ends with three dictums of SER: 1. One election rule does not fit all elections. 2. The need to balance the use of winner-take-all and winner-doesn't-take-all elections to foster a healthy democracy. 3. The sorts of options (FPTP, Rankings, Approval Votes, Cumulative Voting...) given to voters are of secondary importance, albeit it is good to give them more options in winner-take-all elections. Republicans are balking at a Democratic senator's proposal to make it easier for minor parties to be listed on the Tennessee ballot. Democratic Senate Minority Leader Jim Kyle of Memphis wants to set a threshold of 10,000 signatures from eligible voters for a third party to be recognized in the state, down from a GOP proposal of about 40,000 signatures from registered voters. . . .
Senate Majority Leader Mark Norris, R-Collierville, is a main sponsor of the ballot access measure that became necessary because of a federal judges' ruling last year that the state's current standards are too burdensome on smaller parties. . . . Independent American Party activist and frequent candidate, Merritt 'Ike' Yochum, passed away at 9:30 last night of cardiac arrest at a rehab center in Reno, after being released from the Veterans hospital following surgery to treat his esophagus cancer that he had been battling for the past year. He was preceded by his wife of 59 years, Rose Marie Yochum, who passed away on December 24th, 2008. "Ike has been a member of the party since the 1960’s. He has been a good friend, a great candidate and was a good man. He will be missed. I was so happy that I was able to give him a hug and a kiss goodbye as was Lynn Chapman. Dennis Grover also went to see him and Joel Hansen had a wonderful talk with him on the phone. Now he will be helping Danny on the other side. Goodbye dear friend, We love you!" Being the Carson City Central Committee IAP Chairman, Ike had previously served as the CCIAP Chair and was serving as my Vice Chair at the time. I am glad to have gotten to know him and his wonderful wife after moving up to Carson. "That wasn't a election, that was a stampede!" he had exclaimed. "Stampede? What do you mean, Ike?" I asked him, puzzled. "It was a stampede of Lemmings going over a cliff!" Ike responded. As funny as it was, at the same time, he was right on the mark. I will greatly miss Ike, and still especially miss Rose as well. I know they are together again in Eternity. R.I.P. my fellow Independent American, you will be sorely missed! Strategic Election Reform Would Deter War! Why? Because the political-economy of war is simple: the few benefit at the expense of the many and so anything that bolsters popular democracy will deter war. And strategic electoral reform, the use of a better mix of winner-take-all and winner-doesn't-take-all elections, would bolster popular democracy by handicapping the major parties so more people are more likely to be the swing-voters in more elections, while the intere$t$ who benefit from war would have to hedge more by donating to both major parties, which would both lower the return on or effectiveness of their $peech. This and more LTPs would help anti-war activism to check the US's unfortunate imperialistic tendencies. A new all-time high percentage of California voters, 20.4 percent, have no party preference, according to the latest Report of Registration . . . the previous record for the proportion of unaffiliated voters was 20.25 percent of all registered voters, reported in October 2010 . . . The release notes that 44% of California's voters are Democrats and 31% are Republicans. 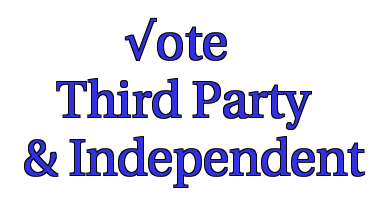 The only third party with more than 1% of registered voters is the American Independent Party, which has 2.34% support in the state. I believe in the USA and the Two Party System, Just Not These Two Parties! To be a devil's advocate, how strident would third party enthusiasts decry a two-party dominated system if it were a different kind of two-party system? What if the two parties on top were rather different and more diversified than our current two conjoined fraternal twins? What if smaller third parties could win more seats in "more local" elections and more voice in all elections? This is what I believe would emerge if we pushed for the use of multi-seated elections in "more local" elections and two-stage elections in "less local" elections. Such a system would increase our learning by doing or greater civic participation in "more local" elections and it might actually stand a chance of emerging in the relatively near future, since the rumors of / hopes for the demise of two-party(or even better one-party) rule in the US are quite exaggerated / deluded in my opinion. 'Engine of the World' writes at Reddit: "IAmA Libertarian Party Member running for State Chairman in Florida. AMAA." According to its 'About' page, Engine of the World is the website of Austin Parris who describes himself as "a registered Libertarian Party member residing in the State of Florida (home of beaches, sunshine, and butterfly ballots)," adding, "I am formerly a candidate here as well, having run for state house in 2008-09." Floridian and active in politics here. How do you plan on getting your third party involved in politics on the state level? Will you put your efforts into getting independent libertarians elected to state house and senate seats, or were you going to go the bigger picture route with Governor & US races? Myself and the three other candidates for the seat will be having a debate on Alexander Snitker's radio show "Liberty Underground" on Friday at 9am. The questions have already been submitted, and here is my answer that I have right now. a. First things first: We need a structured organization and action plan that said organization will implement. I will say that it is not a one-person responsibility, and that we must all be responsible for our part in achieving growth. I think the first thing that needs to happen is that we structure the organization in a way that everyone has a clear, defined role with minimal overlap so that we are efficiently using resources. We all have talents we can bring the table and I want to optimally use those talents to the highest effect possible. Second, if you refer to my website, www.engineoftheworld.com, I lay out my general plan TUSC, which stands for “Testify, Unify, Simplify, Clarify.” Essentially, working from right to left, it means that we have to be able to Testify a Unified, Simplified, and Clarified message that every member of the ideology can embrace and easily promote. TL;DR We have some work to do. Alexander Snitker was the Libertarian Party candidate for US Senate in 2010. See also Liberty Underground for the radio show, and the full post at Reddit. Australia's Rap News takes a jaundiced look at US politics, comparing it to middle eastern tyrannies and saying the American people need to be liberated from "this fascist prison and the two party dictatorship that's arisen under the iron fist of the Republicrat system, preventing democracy and fair elections as well, siphoning massive wealth to a banking cartel.." (the quote is slightly past the minute and a half mark into the video). TiradeFaction is now a Guest Blogger at A New Kind of Third Party! And the cause of Electoral Reform shall be Vaulted to ever greater prominence within the United States as a result! We've found a lot of brutal poll numbers for Sarah Palin so far in 2011: down in South Dakota, down in South Carolina, down in Arizona, only up by 1 point in Texas, only up by 1 point in Nebraska to name a few. But this has to be the worst- independent voters say they would support Charlie Sheen over Palin for President by a 41/36 margin. Seriously. . . .
Sheen's unpopularity is pretty universal across party lines so it says something about the level of polarization in the country right now that Democrats would support him by a 44-24 margin for President over Palin and that Republicans would support him 37-28 over Obama. People may not have any respect for Sheen but they still think he'd be a better alternative than their opposing party's leading figure. As Utah is widely considered to be a Republican Party stronghold, most Americans would probably be surprised to learn that an outright majority of the state’s registered voters are not Republicans but rather Independents. The Utah League of Independent Voters aims to change that. Last week, Randy Miller, founder of the ULiV, decided to put his State Senator and Representative up for sale on eBay to raise funds for the organization and protest a political system that puts party above people. The action caused a small stir in the local press, the Independent political blogosphere and on Twitter, and even provoked a response from the Senator himself. Randy was kind enough to provide a short interview via email. TPID: What made you decide to put your state senator up for sale on Ebay? Miller: Generally, the GOP in Utah thinks they have been given some magic mandate from the people of Utah and they have taken a number of measures for the last 3-4 years to constrict the political process and set themselves up as a 'merchant in the temple' whereby to participate in the political process, one must go through them. And there are other ideological issues not in harmony with the people of Utah. Three years ago or so they passed a school voucher bill. The next year it was overwhelmingly rejected by voters. Redistricting takes place in the legislature this year. 73% of Utah residents support an independent redistricting committee. The legislature refuses to consider the measure. It was not allowed on the agenda in committee last year. There were multiple bills this year to move to partisan elections for state school board positions while 78% of Utahns favor direct non-partisan popular elections for those positions. So when a widget doesn't do what you want it to do you sell it at a garage sale if it has any salvageable value. So that is what I did. Besides it wouldn't hurt to get a little fund raising out of it for the fledgling independent voter movement I have started--the Utah League of independent Voters. TPID: The auction has been taken down by eBay. What did you write on the listing? How long was it up on the site? Buyer beware. This toy is broken. I wish it would be recalled. It is a representative that does not represent. Well, it represents its party well, but fo the people it is supposed to represetn, it just doesn't work. I will consider a trade for a representative that does represent the people of its district well. All proceeds will be used to support and expand the outreach of the Utah League of independent Voters, a voice for the voters in Utah who aren't thrilled with the prospects of parties. We support initiatives like open primaries, non-partisan redistricting and are looking with interest at the initiative to roll back SB165. TPID: What was the response? How many bids were there? What was the highest? etc. Miller: I think there were 19 bids from 7 bidders, 2 of which were personal acquaintances and politicos who wanted to pledge some money even if they didn't win the bid. I got pledges for nearly $1000 and a commitment from them to be on the board and officially make ULiV a PAC. The highest bid was $305. For those who haven't bid on eBay for a while, that means that $305 was an increment just above the second highest bid--the highest bidder only has to pay slightly above the next highest bid. Their bid is automatically incremented up to be more than all second place bids until their bid is surpassed. Somebody evidently bid more than $305, how much I do not know. TPID: Did you receive any complaints from your representative's "rightful" owners in the party, the professional lobbying industry or political class? Miller: No, but somebody probably snitched to eBay. In fact the ksl.com article indicated he thought the gag was funny and laughed out loud. He even commented he wondered how much he was worth. TPID: There have been a number of news articles on your action. What has been the response from the general public? Have you gotten many emails or phone calls? Miller: I have had a few people contact me wondering how they can volunteer. I've received a bunch of ‘atta boys’ from friends on Facebook, but I think more than anything I hit the funny bone of thousands of people who are thinking the same thing, why won't the legislature listen to the people instead of the narrow group of party delegates. The parties would naturally respond (and have) that we are all perfectly welcome to come participate in their caucuses and conventions as if that is the only legally contemplated way to participate at the grassroots level of our democracy. TPID: One article reported that you were trying to raise awareness and funding for the ULIV. Has it been a success in that regard? Has web traffic gone up? Have you received more interest or donations etc.? Miller: Yes. I have pledges from 3 donors totalling in the ballpark of $1000. Two of those donors, close friends and political activists are also willing to form a board and make ULiV a truly legal entity. TPID: Before going to Ebay, did you consider other options such as Craig's List? Maybe you could have traded up for an Independent lawmaker? Miller: Somebody did recommend that I forget eBay, move and and make the listing on Craig's List. Truthfully, I don't know the ins and outs of craiglist very well. I'm not opposed to it, but I think the novelty of a real time auction had some real interest and appeal. TPID: What is the mission of the ULIV? What does the organization have planned for the future? Miller: The mission of ULiV is to open up the democratic process to the people to whom our government rightfully belongs--the people. We are not concerned about ideological differences. I am not concerned if the voice of the people goes in a direction that I think is imprudent or doesn't fit with my ideology. The mission of ULiV is to act as a voice for the nearly 800,000 strong, 51.5% plus majority of [Independent] voters in Utah. These independents no doubt are concerned about the partisan filters of caucuses, primaries and redistricting which are not legally contemplated to be controlled by factions through which candidates must pass before being presented to the voters. The folly of that arrangement has come to the forefront after this legislative session. Perhaps we are building enough political will to turn the corner and instill some equity into our governing processes. TPID: Do you have any plans for another auction? Miller: I am planning on listing the offending legislators on boocoo.com later tonight with some weasel words added to prevent the account from being suspended in like manner. The funny thing about eBay is that they suspended my account for one year for "selling Human Body Parts and Remains". Seriously, if somebody was really doing that I would hope they would call the police and terminate the account permanently. Hard to know what makes them tick. TPID: Thanks for taking the time to answer these questions! Readers should be sure to check out the ULIV’s main site as well as Randy’s blog. As of this posting, the new auction at boocoo is still online. The current price for Sen. Stevenson is $0.01. Our Republican Wall of Shame ad is now live on the Washington Post website. The ad appears intermittently throughout the site in the rightmost column. To make it easy for supporters like you to find the ad, it should appear more consistently for the rest of the week on this particular page. . . . Today we sent a press release about it: Press falsely credits Republicans with "deep cuts." On March 10, 2011, the Executive Committee of the Libertarian Party of Queens County unanimously adopted the following resolution, which contains a "strong recommendation" to LPQC members NOT TO ATTEND the New York Libertarian Party's State Convention scheduled to be held on Saturday, April 30, 2011 in Suffolk County . . . The Green Party of New York said today that state Democratic and Republican Parties have become an organized crime family at the State Capitol. “Rather than starting the legislation session with the pledge of allegiance, state legislators and the Governor should submit to a lie detector test as to whether or not they have solicited any bribes or kickbacks that day. The indictment rate of state legislators exceeds that of the mafia, but instead of hearing lawmakers demand investigations and reforms to clean up the corruption, they make poor people get fingerprinted to get a few crumbs,” said Howie Hawkins, the recent Green Party candidate for Governor. Hawkins noted that with today’s criminal indictment of Senator Carl Kruger, three of the four so-called Amigos who threw the State Senate into chaos over the last year have been criminally indicted. Assemblymember Boyland was also indicted today. Krueger is the second corruption case involving State Senators in the last three months, following former Senator Leibell who pled guilty to corruption. Hawkins said the skyrocketing rate of criminal indictments and convictions of state lawmakers was just the tip of the iceberg . . . US Green Party leaders urged a moratorium on nuclear power plants and cancellation of license renewals for 23 General Electric reactors in the US that have the same design as reactors in Japan. Greens also called for a close monitoring by US agencies of radiation levels throughout the Pacific and along the west coast, with accurate information published about any radioactivity discovered in these areas, especially in farm produce and other food supplies. In the event of radioactive emissions from Japanese nuclear power plants damaged by the tsunami, Greens said President Obama must authorize public health agencies to make potassium iodide pills and filtering masks available for young people in Hawaii, Alaska, and the west coast of the contiguous states. . . . I proffer over at "A New Kind of Third Party" that the use of multi-seated state legislative elections would handicap the rivalry between the two major parties just enough that we'd see a "red queen effect" where there is a political "evolutionary arms race" between them. Both would need to innovate themselves on an ongoing basis just to retain their relatively large "market share" of the US polity, which would more often than not be to the advantage of political outsiders (like us) who have ideas/needs that can easily be presented in ways that appeal to the center or most US_Americans. A Green Democratic and a Libertarian Republican Party Would Both Be More Green and More Libertarian (or Less Corporatist)! This is the alchemy of strategic election reform when we balance the use of winner-take-all and winner-doesn't-take-all election rules in our political system. We'd still have relatively few major parties and they'd still tend to act like conjoined fraternal twins due to the use of winner-take-all elections, but because of the use of more winner-doesn't-take-all election rules they'd need to give more folks more voice on more issues to remain one of our top two major parties. The consequence of which is that the entire system would become more dynamic and quite unlike our current political system! Which Two Major Parties might we have in the next decade? Is the question that I speculate about over at A New Kind of Third Party! I predict mergers and a divergence between economic conservatives and social conservatives so that in some states the US develops its own versions of the Christian Democratic Union parties common in Europe. With the growth of “decline to state” voters, I started wondering when they would outnumber Republicans in California and Democrats in Orange County. The projections here are based on the rates of change for each category from 1994 to 2010, using the voter registration numbers at the time of the general election. . . .
NY: Third Party Tea Party Candidate in Special Election? Jack Davis did not win the Republican or Conservative Party lines for the unscheduled special election to replace Rep. Chris Lee (R-N.Y.). But the wealthy businessman is continuing to court tea party activists in the 26th district to help boost a third-party run. “I just know that he’s been calling us and wants to get together with my husband,” Julianne “Jul” Thompson of TEA New York told Roll Call on Tuesday afternoon. Thompson and her husband, Rus, co-founded the group, which is the area’s largest tea party organization. Davis, who ran for the seat in 2006 and 2008 as a Democrat, sought the Republican nomination last month, but the district’s county GOP chairmen unanimously selected state Assemblywoman Jane Corwin, who also recently captured the endorsement of the state Conservative Party. . . .
As Arizona drowns in red ink, the state Legislature appears to be more ideological than pragmatic in dealing with the myriad problems facing our state. In a state where registered independent voters are the fastest growing political bloc (recently surpassing Democratic voters in numbers), not a single independent serves in the Legislature, and moderates of both major political parties are routinely beaten in primary elections by extreme conservative and liberal candidates. Is the Arizona electorate as polarized and out of touch with the rest of the country as it seems, or is the moderate middle being disenfranchised by well meaning "reforms" that have had unintended consequences? The following are suggestions (some borrowed from a recent Arizona Town Hall) that could make Arizona's Legislature more pragmatic and less ideological . . . The Massachusetts Election Division has approved the Massachusetts Pirate Party as a political designation, allowing voters in the state to register as a "Pirate." The party strives to increase government transparency, promote personal privacy, reinforce the spread of knowledge through copyright reform, and abolish patents. "We live in a country founded on the ideals of life, liberty, and the pursuit of happiness," the Massachusetts Pirate Party said in a statement. "For many people, those ideals are not real. The Supreme Court and Congress have expanded the power of corporations and made them more powerful than people. Increasingly government officials ignore open meeting laws, make deals favorable to corporations behind closed doors and sell off our public information to private interests." . . . . It's finally happened, and the US has it's first official Pirate Party. The Commonwealth of Massachusetts approved the Massachusetts Pirate Party for inclusion on the ballot earlier this week, meaning that it's the first place in the country where you can 'vote pirate' . . . The US has a strong history of using Multi-Member State Legislature Elections! is the title of a new post over at A New Kind of Third Party! But I spend less time on a history lesson and more time on the evidence that Arizona's 2-seated state house of representative elections lowered the percentage gain in the odds of a state-rep being a Republican vs a Democrat. The moral of the story being that almost any alternative to the winner-take-all, first-past-the-post election rule used way too much in the US serves to prevent a small but highly motivated portion of our population from exerting way too much influence on the composition of our gov't. Many lawmakers might feel like running out of the room when conservative activist Janine Hansen gets up to testify. Only one actually does: her nephew. Janine Hansen, part of the Hansen clan that launched the Independent American Party in Nevada , testifies multiple times a day at the Legislature in her role as president of the conservative Nevada Families Eagle Forum. But if she steps up to the microphone in the Assembly Judiciary or Education committees, her nephew Assemblyman Ira Hansen, R-Sparks, will leave his seat and wait outside until she is done testifying. To read more of Anjeanette's article, click here. Further bureaucratize the process of filing to run to office and report on campaign contributions, even on the municipal level. Increase the number of campaign finance reports. Create stricter and more harsh penalties for those that fail to file campaign finance reports on time. However, one strong voice that spoke out against such potentially anti-democratic legislation was the Independent American Party, Nevada's largest and most organized third party in the state. "I would be a virtual felon." Janine had previously been hit with several fines for filing a campaign report improperly during a previous election when she ran as a candidate for the IAP, even though the Secretary of State's office failed to inform her that her report was flawed in the first place, and had slapped her with a 15,000 dollar fine without warning. The American Civil Liberties Union also spoke out in opposition against the bills, arguing that many parts of the Miller's proposed legislation would violate First Amendment rights as well. America is enormous, and with so many different opinions and political philosophies, it is absurd to think that holding an election with only two parties really results in an accurate picture of where the populace stands. All our elections do is force people to choose between two groups that don't actually stand for much at all. Both of the major parties would have you think that they are the party of "you." But they hardly ever have you in their minds when making policy. The Republican Party would have us hand over our livelihoods to the Chamber of Commerce so that the Chamber can feed Wall Street, while the Democratic Party would have us answer to a Democratic administration that would ultimately serve those same corporations. Basically, when you go to the voting booth you have a choice between two corporate parties, both wanting to feed the cash cow on Wall Street in order to maintain the status quo. . . . . So what can be done? Our best chance of reforming electoral politics is to open up the national debates . . .